A perfect quote to sum up my feelings about finding Sky Watch Friday. Now I have a reason to look up more often, not just seeing the sky but framing up beautiful or interesting scenes to share. Link to Sky Watch Friday participants from around the globe. Some of the other forms of mixed media I like to play with include ATCs, Inchies & Moos. If you have not tried them before they are great fun and quick because they are so small. Here is a bit of background on what they are all about. ATCs are Artist Trading Cards and as the name indicates, ATCs are tiny collectable pieces of art with a fascinating history. The legend is that ATCs span back thousands of years and were traded between artists as a sample of their style & techniques. Almost like a business card for artists, with art on one side and contact details on the back. More recently a Swiss artist M. Vanci Stirnemann created a show based on ATCs in 1997 and started a trading session in Calgary Canada. Stamps courtesy of Amazing Arts & All About Paper. Mixed Media Monday is hosting a challenge on Trinchies in all kinds of different styles. Such a beautiful, serene picture and such a true quote too. Oh – I love that quote! I’ve had it written in my inspirational quote book for quite some time – it’s so perfectly stated!<BR/><BR/>Love your Sky Watch contribution for this week too – so peaceful and serene! The sky is lovely and so is the quote. Great one for SWF! If someone were to think that trees are made to support the sky, they would all seem too short…. mine’s up too hope you can drop by…. Happy weekend! What beautiful blues. The water looks so calm and clear. Very nice, serene looking place. Pearl: What a great lake and Sky shot. A stunning meeting of blue meets blue! What a picturesque sight! I love your picture!<BR/><BR/>Hope you can hop by my SWF photos in these blogs:<BR/><A HREF="http://www.jennwashere.com/macanlaoan-beach-bolinao-pangasinan/&quot; REL="nofollow">Jenn Was Here</A><BR/><A HREF="http://shutterhappenings.blogspot.com/2008/08/bangui-windmills.html&quot; REL="nofollow">Shutter Happenings</A><BR/><BR/>Thanks! Happy Friday! 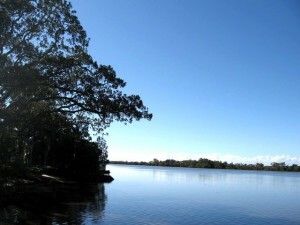 It is so serene, and so blue. I’e always enjoyed taking an upward view and SWF is a great outlet for that. Plus there’s so many talented people here. Beautiful shot and quote. Nicely framed, and a good choice of what to photograph! You’ve certainly chosen a lovely one to share this week. So serene. Such a perfect sky over beautiful water! Thanks for visiting me. Thank you for stopping by. We love the Wooli area and have spend happy times, still do when ever possible. Your art is beautiful, I didn’t know about the art of altered books. Learned something new! I knew about postal art, it is quite appealing. I was always attracted to miniature paintings.) Your SWF is a lovely, serene photo and a beautiful quote, love that too. Great SWF contribution! It is a great shot… beautifully composed! I like how you used all the pieces as a set in the book. Wonder idea–lovely work. The Twinchie is really cute. Love the butterflys. What a beautiful view. 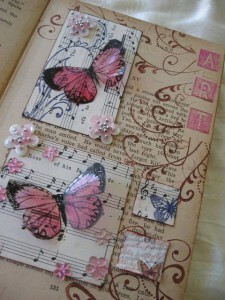 And your mixed media piece is stunning – I love the butterflies. You are really creative. <BR/><BR/>Sharon<BR/><BR/>P.S. The piece that you did for me (for the mermaid swap)now adorns the wall above my work computer and draws many compliments. I love both of these! The sky and quote are perfect! The info on the ATC’s is fascinating! Thanks! The mixed media is beautiful !!! I love it !!! Leave a Reply to Rambling Woods Click here to cancel reply.